Going on a Cruise is an easy, fun, convenient way to travel. See beautiful sights and experience beautiful destinations in one cruise vacation. There is nothing easier than simply waking up in the morning in the world’s most exciting and interesting cities. Your cruise fare includes accommodations, dining, entertainment and an several scheduled activities. Enjoy some of the best locations without having to pay for costly airfare, trains, or motorcoaches to get you from one city to the next. 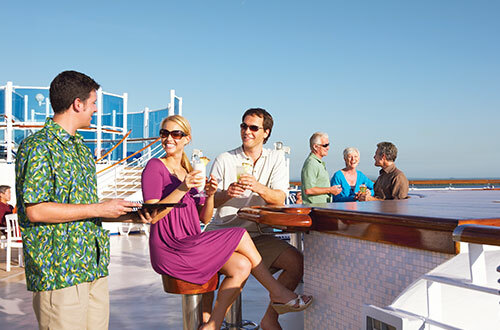 Celebrate everyday onboard – cruises are great for birthdays, anniversaries, weddings and more. Whether you’re celebrating a life milestone, a special day or a special someone, you’ll enjoy extras that make for a truly unforgettable voyage. Almost There Travel can help you plan your cruise with any of our cruise travel partners below. Have a question about the cruise lines? Contact Us and we can help you select the one that best suits your style. Compared to a land vacation, a cruise with Princess provides a great value for your vacation dollars. Your fare not only includes the comfortable accommodations of your well-appointed stateroom, but also many of our fresh dining options, dazzling entertainment and access to our health and wellness facilities. Celebrity Cruises’ iconic “X” is the mark of modern luxury, with its cool, contemporary design and warm spaces; dining experiences where the design of the venues is as important as the cuisine; and the amazing service that only Celebrity can provide, all providing an unmatchable vacation experience. In addition to offering vacations visiting all continents, Celebrity also presents immersive Cruisetour experiences in Alaska, Australia/New Zealand, Canada, Europe and South America. By the end of 2012, Celebrity Cruises has a fleet of 11 beautiful ships.